The official press shots of the 2014 Mazda3 showed up online earlier today, and — surprise! — it looks just like the car we saw on Russian Facebook and in a Japanese magazine. Fans of fun economy cars, meet your new ride. The photos of the new car surfaced hours ahead of its actual debut today on an XBOX Live stream. On the outside, the car takes many cues from the 2014 Mazda6 and Mazda CX-5, ditching the goofy smily face grille for the company grille and some sleek curves. The inside looks to be rather 6-y as well, and at least at first glance, it seems to be an improvement over the old 3's button-strewn, plastic-y interior. According to Autoguide, the car is 1.6 inches wider and has 2.5 more inches of interior room than the old car, but it's shorter overall by two inches. Kudos to Mazda for not bloating it up. 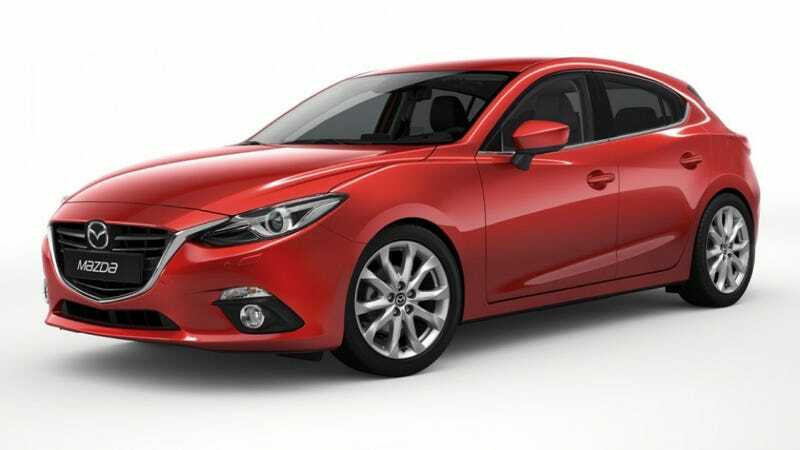 Autoguide reports two engines will be available in North America: a 2.0-liter Skyactiv four cylinder engine with 155 horsepower and 150 pound feet of torque, and a beefier 2.5 liter Skyactiv four from the Mazda6 with 184 horsepower and 185 pound feet of torque. Zero to 60 mph times for those cars will be 8.9 and 8.2 seconds. Hopefully, it will be an adept handler as well. Two things I want out of this car, though: a Mazdaspeed version and the Skyactiv diesel for the U.S. No word on those yet, but let's keep our fingers crossed.